Last time I checked in I showed you guys the beginning stages of some small changes that we’ve been making in our living room over the past few weeks and today I’m back to show you what else we’ve been up to. The next set of changes we recently made involves a part of our living room the blog hasn’t even seen yet – our media wall. 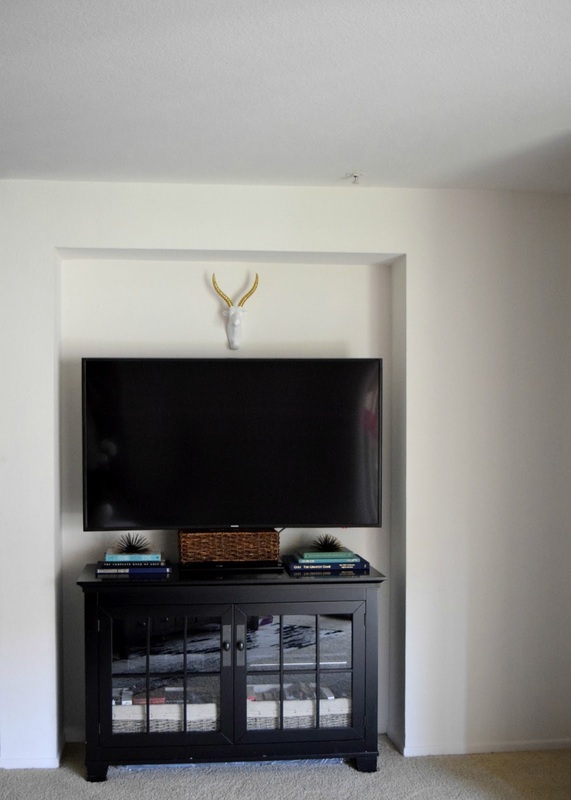 Decorating your home to accommodate that uber important TV is often challenging, and in our case, was only made worse when we purchased a larger, more obnoxious television to replace our old, on the edge of death, TV. After purchasing the larger TV, we were forced to do some furniture musical chairs when it became clear that the wall that used to house the TV, was way too small. The previous media wall, as seen in this really bad cell phone pic, shows just how cramped the previous situation was to begin with. 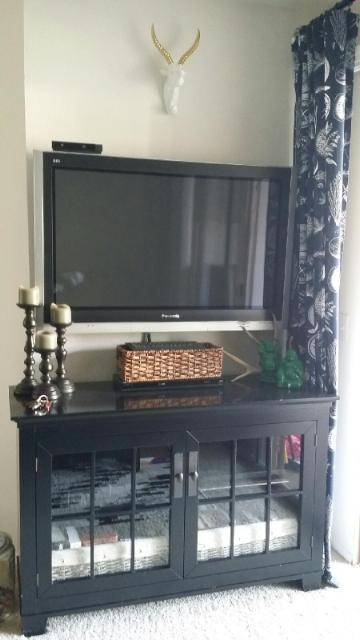 The TV and media cabinet were smashed up against the curtains and sliding glass door leading out to our patio leaving no extra room to accommodate a larger TV. So…with a new TV and the realization that the existing wall was too small, we did some rearranging and moved the TV, the media cabinet, and Anthony (the antelope) to an adjacent wall with a really annoying nook that I’ve hated since the day we moved in but since it was the only other place for the new TV, we had to make it work. The nook is off center on this wall and for a person that really gravitates towards symmetry, it’s always been a nightmare for me to decorate around. This little nook has seen quite a few changes in the 2 years that’s we’ve lived here which I plan to document in a future post, but this go-around in the nook is by far my favorite. 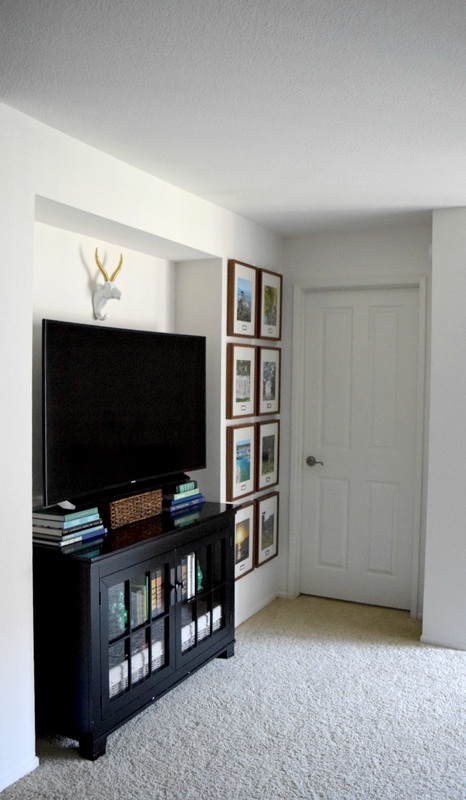 After moving everything over into the nook, the entire wall felt visually heavy on the left and really empty on the right, making the nook all that more prominent and irritating! I didn’t have much space to work with on the left but I knew that it definitely needed something to visually balance everything out and with all the craziness going on to the left, I thought something clean and symmetrical would be the best solution to both my problems. 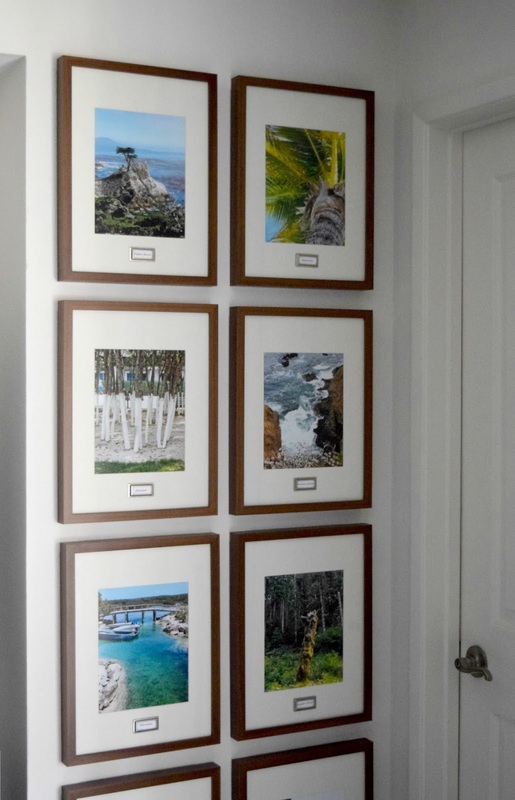 I decided to do a gallery wall of frames filled with pictures from some of our most memorable travel adventures. The inspiration for this came directly from these two awesome bloggers as seen on their sites here and here. 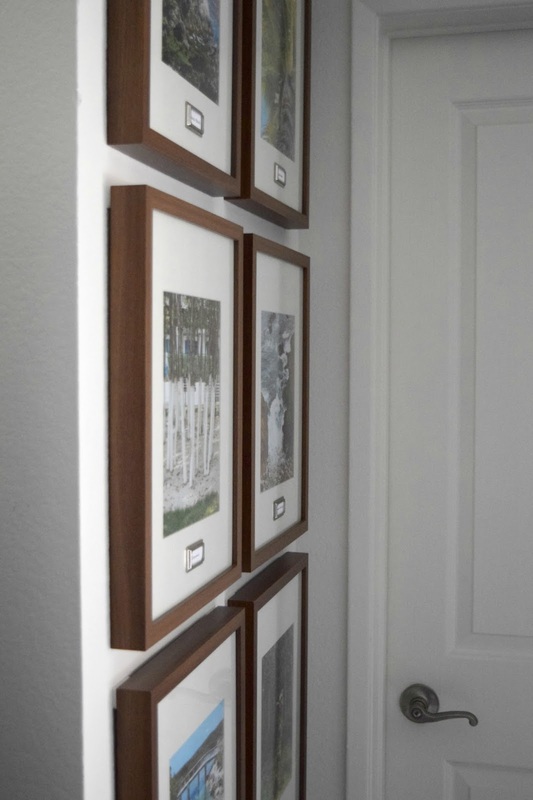 For the gallery wall I chose to go with these warm wood toned frames that I scooped up at Ikea. I’ve been on a mission to bring in some wood tones and textures into our home to warm things up a bit and balance out our other black furniture pieces and I think these frames did just that! 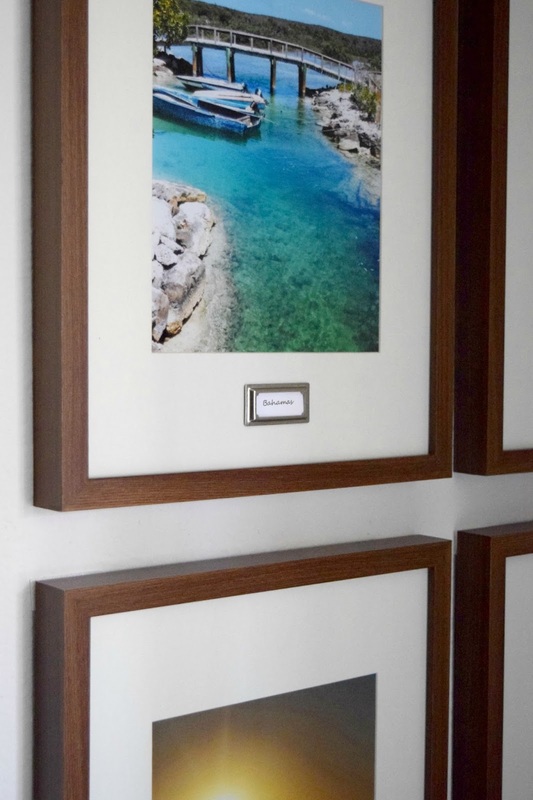 I chose vacation photos that were bright, bold, and full of vibrant colors! It’s the perfect way to display our personal memories in a very subtle way while bringing in some fun colors at the same time. To put my own little spin on our travel adventures gallery wall, I used my all time favorite (but sadly discontinued) Martha Stewart bookplate labels on the glass of each frame to name the travel destination pictured. Great thing about this is no matter what picture you showcase, the label can always be updated easily as you add more destinations to your passport! And for those with a short term memory, you’ll always have a handy reminder of where your photo was taken! 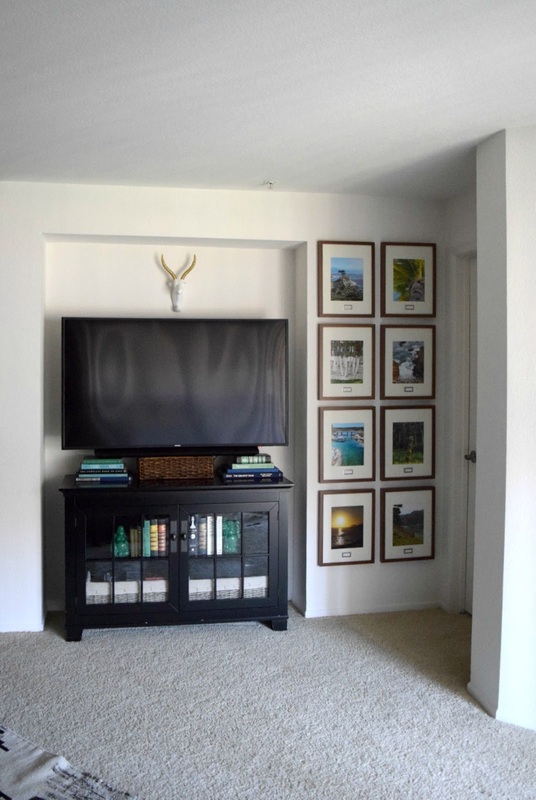 To hang the pictures, I used every renters BFF – 3M Command Strips (you can see the little bump out of the Command Strip on the top of each frame in the photo below). Using 3M Command Strips saved me from putting 16+ nail holes in the wall and from having to patch all those holes when we leave. Plus, 3M Command Strips are re-positionable and made it easy to make sure my grid lines were nice and straight. Can’t beat that! There’s still one more change I’m working on to round out our living room refresh, be sure to check back soon so you don’t miss out!